In a world of text messaging and twitter, writing a proper thank-you note has become a lost art. We express our appreciation by quickly texting THNX!!! while out-and-about and multitasking on smart phones. In contrast, in order to write a thank-you note you must sit at a desk and have a pen, stationery, and a stamp on hand. You need to write legibly, know your recipient’s street address, and have ample time and quiet to focus on expressing sincere gratitude. Unlike texting, however, sending a thankyou note shows that you are willing to sacrifice precious time to appreciate fully what you have been given. In Torah portion Vayikra, God commands the Israelites to donate the first fruits of their harvest to the Temple. Though the Israelites worked hard all year to grow their crops and waited anxiously to see the fruits of their labor, they were required to give away their best produce instead of enjoying it themselves. Donating their first fruits to the Temple was an expression of gratitude for all the goodness in their lives. A properly handwritten thank-you note would have been insufficient for the Israelites to thank God for the blessings in their lives. Like the Israelites, we too have much to be thankful for in our lives. But how do we express our gratitude? How do we sincerely thank the people in our lives who give us the gifts of time, support, and love? The next time you have the urge to quickly type THNX!! !, take a moment instead to express your appreciation more slowly and thoughtfully. The fruits of your labor will be greatly appreciated in return. TALK TO YOUR KIDS about what they are thankful for and how they express their gratitude. How do you express your gratitude – to your friends, your family and your teachers? Have you ever written a thank-you note? 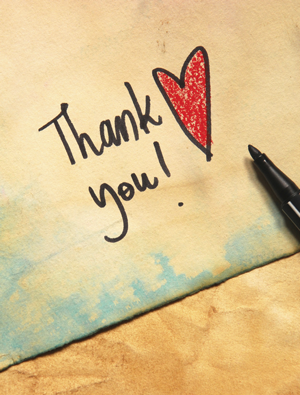 Have you ever received a thank-you note? What did it say? How did it make you feel? If you could write a thank-you note to God, what would it say? 2: Parshat Vayikra: Why were Ancient Sacrifices Important? 5: Vayikra: How Can We Relate To Sacrifices Today?